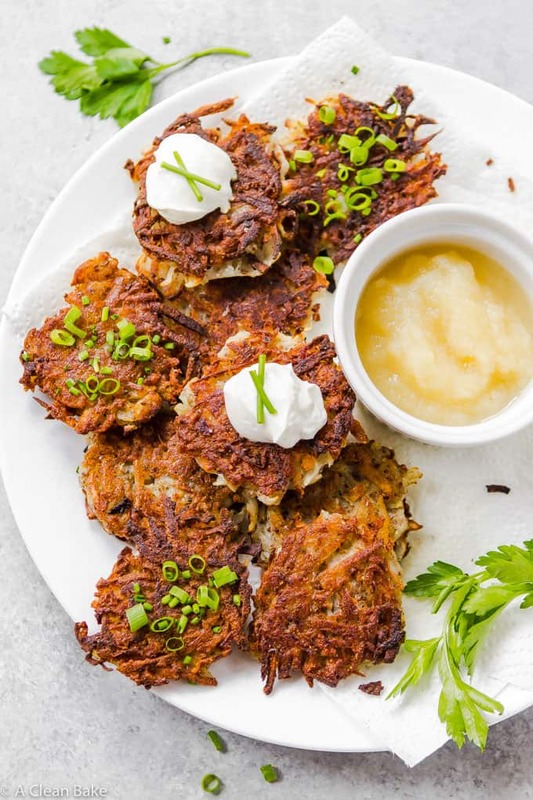 There are plenty of recipes for potato latkes out there, but this one is special because these potato latkes contain NO gluten, grains, eggs, or dairy! 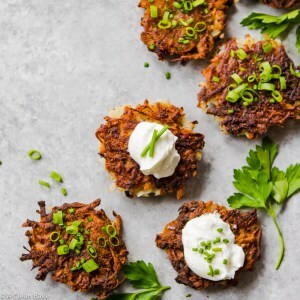 There are… let’s say numerous potato latke recipes out there. 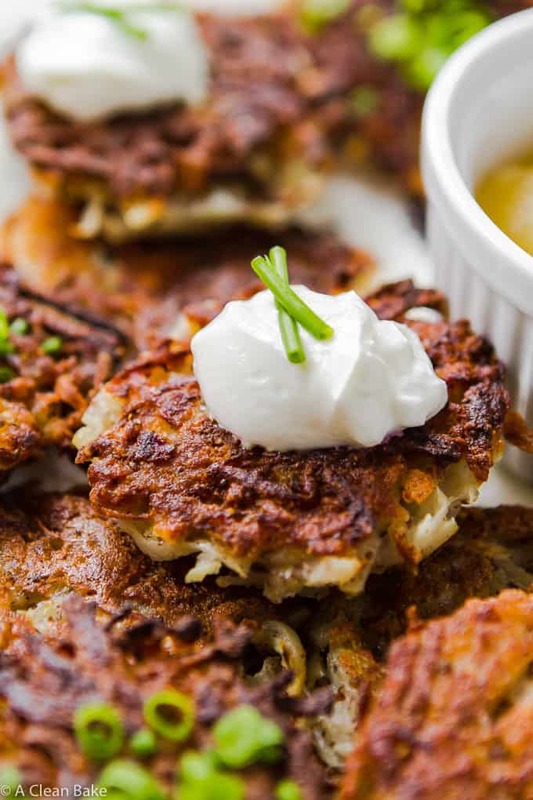 Google “latke recipes” and you have 352,000 choices at your fingertips. While that is fewer results than you might expect, it’s probably because everyone kinda wings it, throwing together their potato pancakes from the vague memory of their Aunt Myrtle’s method. So counting everyone’s Aunt Myrtles, there are, let’s say, one gazillion traditional family latke recipes floating around. And I’m guessing every last one of them contains eggs and wheat flour. Which is a real bummer if you can’t eat either or both of those ingredients. When a reader responded to my last email newsletter asking if I had an egg free traditional latke recipe that I could point her to. While I do have a gluten free latke recipe on the site already, it is neither traditional, nor egg free. And one out of three just won’t cut it. It turned out to be much simpler than I thought to make non-traditional traditional potato latkes, which is to say that removing the egg wasn’t as catastrophic as I thought. It took about four tries to figure out that the optimal egg and flour replacement ingredients was a combination of flax meal, tapioca flour, and blanched almond flour. This is a pretty standard vegan egg replacement ingredient, so it made sense to start there. Too much makes the latkes look really unappetizing, but too little makes them fall apart. The sweet spot is about 2 Tablespoons. You’ll notice that the recipe does not call for making a flax egg (mixing flax meal and water and letting it stand to thicken before mixing it into the batter). That’s not a mistake. There is plenty of moisture in potatoes that the flax will absorb. There is no need to add more. I like using tapioca flour for absorbency because, of my go-to grain free flours (almond, coconut, and tapioca), it acts most similarly to wheat flour in this application. The caveat about tapioca flour is that, unlike wheat flour, too much of it can result in a gummy consistency. In my first two versions of this recipe, the adhesion was great, but the latkes were coming out really gummy. It turns out that using part tapioca flour (for absorbency) and part almond flour (for adhesion) works just fine. If you need to make this nut free, eliminate the almond flour and use a total of 1 1/2 Tablespoons of tapioca flour. It will change the consistency of the latke slightly. It is my profound belief that you should taste the onion in your potato latkes. 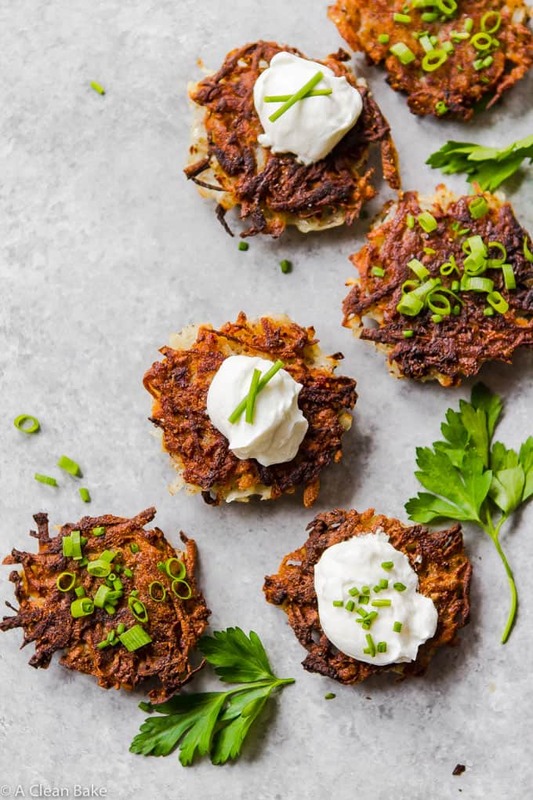 Ingredients shouldn’t be included in a recipe when they serve no purpose, and those latkes that contain just a whisper of onion just taste like hash browns to me. 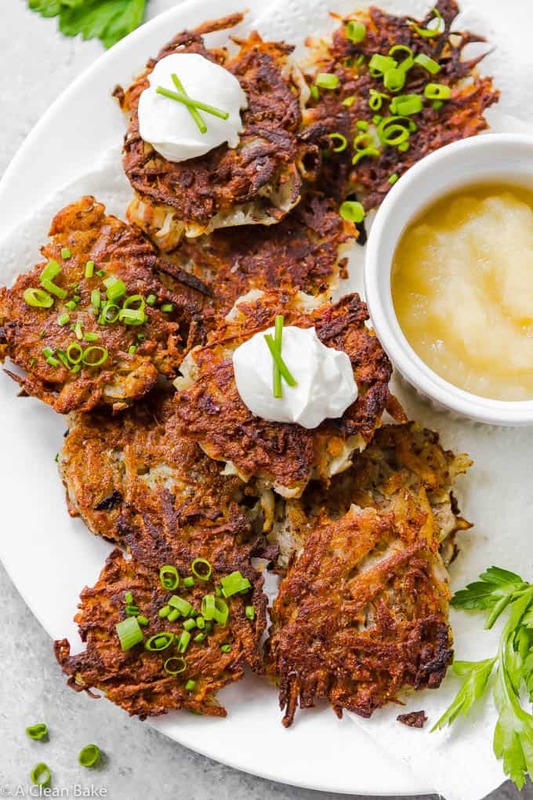 Now, I love a good hash brown, but potato latkes are not hash browns! The problem is that, in order to get that notable onion flavor, you need a bunch of onion. Onions contain a low of water, which they release when they cook, resulting in either a really soggy latke or – if you add enough tapioca flour to absorb the extra moisture – a really gummy latke. Neither one is a potato latke worth eating. Onion powder provides a nice onion flavor without any moisture. As you’ve probably noticed if you’ve been following this space for awhile, I am actually a huge proponent of using dried herbs, spices, and aromatics in your kitchen. They are cost effective, and have a longer shelf life than their fresh counterparts, so you can always have whatever you need on hand (pro tip: freeze whatever you’re not going to use in the next 3 months, to maintain its flavor). But that the downside of using onion powder (or any dried herb, spice, or aromatic, especially in powder form) is that there are a lot of really poor quality products out there. 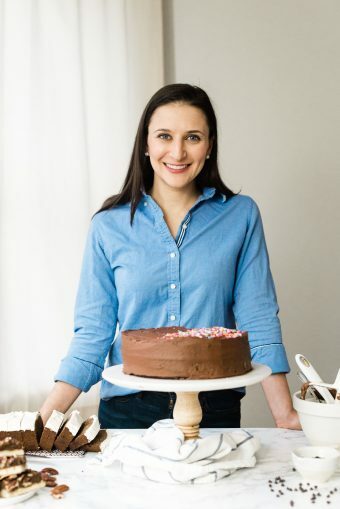 Don’t just grab the cheapest option (it can be tempting, I know); always read the label to make sure there is no added salt, and no preservatives or anti-caking agents in the product. So there you have it: a potato latke that everyone can have this year! 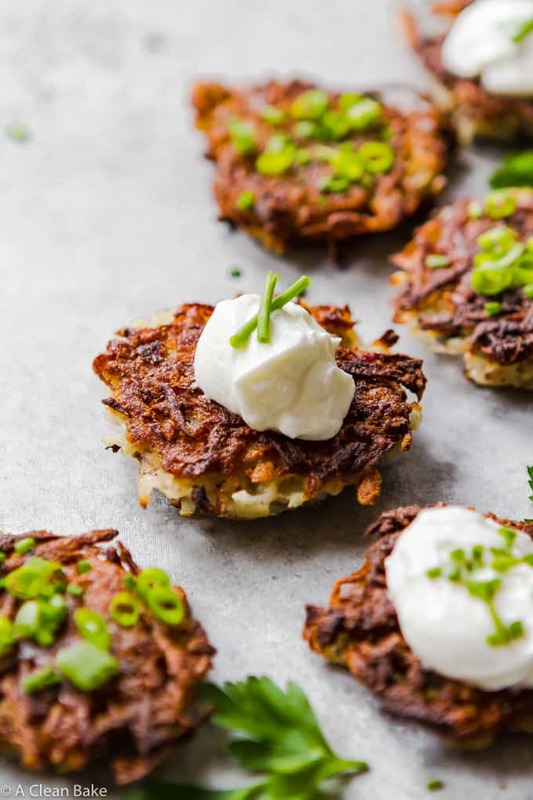 There are plenty of potato latke recipes out there, but these are special because they contain NO gluten, grains, eggs, or dairy! Peel, then shred, your potatoes. Let shredded potatoes sit for a couple of minutes, then wrap them in a clean kitchen towel and squeeze as much moisture out of them as you can. Don't worry about getting every last drop. In a small bowl, mix together the tapioca flour, almond flour, flax meal, and onion powder. Add the flour mixture to the shredded potatoes, and toss to coat well. Add the oil, and mix well. Preheat a heavy skillet or Dutch oven (I recommend cast iron for this job). Add enough oil to make at least a 1/2" layer in the bottom of the pan (see note) and let it heat until it sizzles when you drop a shred of potato in it. Use an ice cream scoop to portion your latkes. Roll each scoop firmly into a ball, then press gently into a pancake. Place each pancake into the prepared pan. Cook until the bottom is deep golden brown (timing will vary based on your stove and the thickness of your pancake), then flip and cook until the other side reaches the same color. Remove from pan and place on a plate covered with several sheets of paper towel to drain the excess oil. Eat immediately, while still warm. Optional toppings/garnishes include: applesauce, sour cream or plain yogurt, chopped chives, sliced green onions, or a sprinkle of chopped parsley. There are lots of opinions about how to shred your potatoes. Some say a box grater produces a superior latke; others say the food processor saves time and allows you to make huge batches of these without collapsing from exhaustion and numb arms. I used a box grater for the potatoes here (it's easier to clean! ), but you can use whichever tool works best for you. To make these nut free, eliminate the almond flour, and use 1 1/2 Tablespoons tapioca flour instead. To make these Paleo compliant, sub white sweet potatoes for white potatoes. Onion powders can run the gamut in terms of quality. I love using dried aromatics for the convenience factor, but make sure you are using a product that consists of nothing more than onions. I shallow fry my latkes, meaning there should be a generous (minimum 1/2") layer of oil on the bottom of the pan before adding the latkes. If you prefer to deep fry yours, ensure there is enough oil to fully cover the latkes, and preheat it to 370-375° before cooking. Do not use olive oil to cook these. It doesn't hold up to high heat cooking. Coconut oil works well due to its slightly higher smoke point, but I prefer avocado oil, which has the highest smoke point of the three. Note: Nutrition does not include frying oil. My mom and I made these NUT FREE AND FOLLOWED THE RECIPE EXACTLY! MY DAUGHTER US HAVING A CHANUKAH PARTY AT SCHOOL TOMORROW AND I THOUGHT SHE MIGHG NOT BE ABLE TO PARTICIPATE IN THE EATING. NOW SHE CAN! This recipe is a lifesaver! Amazing to hear!! Thank you so much for telling me. I’m thrilled to hear that she will be able to enjoy the party! Happy Hanukkah!! If I need to leave out the almond flour is the 1.5 tab topica, in addition to the 3 tab topica? I made these and ate them with my fiance in exactly 30 minutes. They are the best latkes I have ever made, vegan and gluten free or not. I just found out about a recent egg, dairy and wheat intolerance so finding recipes of this caliber really makes my day. Thank you so much for sharing this with the world, you are a great recipe developer! Unfortunately, I don’t know for sure of a reliable replacement, but you could try cashew flour (as long as your son can tolerate other tree nuts). I can’t guarantee it will work, since I haven’t tried it myself.